Pamela Scully (left), Emory’s vice provost for undergraduate affairs, introduced a panel discussion on “Law, Academic Freedom and Higher Education.” Panelists included (left to right) Mike Raeber, general counsel for the University of Georgia; Julie Seaman, associate dean for academic affairs at Emory Law; and Steve Sencer, Emory’s senior vice president and general counsel. Emory Photo/Video. Deborah Lipstadt, Emory’s Dorot Professor of Modern Jewish History and Holocaust Studies, has spent her career defending free speech and calling out lies disguised as facts, including winning a high-profile legal battle with a Holocaust denier who sued her for libel. Lipstadt drew on her experiences, and those of other academics and writers, as she delivered the first keynote lecture at the Emory-hosted conference “Academic Freedom and Free Speech on Campus,” which took place March 21–23. The groundbreaking conference brought together leading faculty, staff and student voices, some from neighboring colleges and universities, others from institutions across North America. In an era that has witnessed violence on campuses over speaker selections, ranging from University of California–Berkeley to Middlebury College, conference participants focused on revising the terms of this fraught discussion, seeking to counter controversy with creative problem solving. Representing a yearlong effort on the part of the offices of Undergraduate Affairs and Campus Life in the Office of the Provost, the organizing committee consisted of Michael Shutt, senior director for community in Campus Life; Alexander “Sasha” Volokh, associate professor of law; Henry Bayerle, associate professor of classics at Emory’s Oxford College; and Pamela Scully, vice provost for undergraduate affairs and professor of women’s, gender, and sexuality studies and African studies. Shutt and Scully were the conference co-hosts. 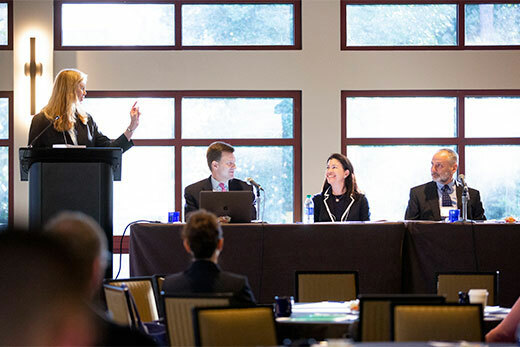 “By coming together as administrators in undergraduate affairs and Campus Life as well as professors of law, history and classics, we represented the range of ideas and interests we wanted to capture through the conference,” Scully explained. The conference’s first day was designed to have a more academic, theoretical bent and to foster shared understandings of the relevant terms: How should “academic freedom” and “free speech” be understood? Is free speech identical to academic freedom? Or are they complementary concepts that protect different sorts of values? Given the range of institutions represented, it was important to establish the differences guiding the conduct of public and private universities. The opening discussion, “Law, Academic Freedom and Higher Education,” made clear that public schools are legally bound to adhere to First Amendment principles, whereas private schools such as Emory choose to abide by them. The conference also shed new light on how speech can be suppressed. Nancy Leong, law professor at University of Denver, argued that sexual harassment is often not recognized as having a free-speech component. “Sexual harassment suppresses important speech, and not exclusively by women,” said Leong, who added that with increasing numbers of faculty not being tenure-track, they face fewer protections and greater risk. On the second day, Emory shared its expertise in a panel titled “Open Expression at Emory.” Karen Andes, associate professor of global health at Emory, talked about what prompted the policy’s creation: the arrest of seven students — four from Emory, three from local colleges — on campus in 2011 after they refused to vacate a makeshift tent city they had occupied for several days to protest labor practices by the university’s food and beverage vendor at the time (Emory selected a new vendor in 2015). That event spurred introspection about what the nature of community should be at Emory and what part open expression should play in students’ education. Then-President James Wagner formed a commission to move the university from a crisis-response model to a student-development model. What is now known as the Respect for Open Expression Policy came into being two years later. Volokh chairs the University Senate committee that investigates policy violations. Emory also created the Open Expression observers, a group of more than 60 faculty and staff who protect the rights of community members to express their opinions in non-disruptive ways. Emory has earned a “green light” rating for protecting free speech on campus from the Foundation for Individual Rights in Education (FIRE). During another conference session, Greg Lukianoff, president and CEO of FIRE, referenced a 2017 survey that his organization conducted of 1,250 college students in the United States about their attitudes toward free expression. The survey showed that a majority of students self-censor in class, support disinviting guests they disagree with and aren’t aware that hate speech is protected by the U.S. Constitution. And it is not just students who self-censor; faculty at the conference acknowledged doing the same. Indeed, some have banished computers from the classroom so that their words cannot be recorded and disseminated. Across a number of the sessions, there was a focus on what the right classroom environment is from the standpoints of challenge and comfort. As Shutt reflected on the two-day conference he had worked more than a year to bring about, he noted, “Next year, Kent State University and the United States will commemorate the 50th anniversary of the killing of four students by the U.S. National Guard on Kent State’s campus. Our work related to free speech and protest on campus must never forget this moment.